B.P.O.E. Lodge (Hudson House) in background. 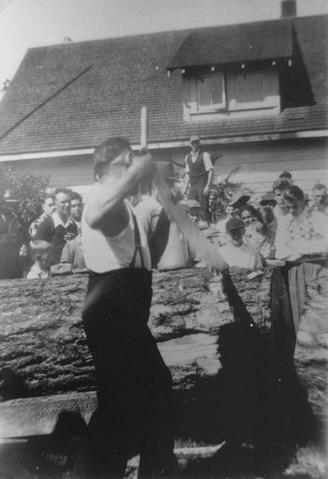 Austin Harry (Peḵultn Siyam), of Squamish Nation, lived in Sta-a-mis in the early 1900's. Hudson House was originally built in the 1930's as a local community hall (PGE Hall). Built by railway and community volunteers, the PGE Hall was once the site of basketball games, dances, and other gala community events. It later became the Hudson House, and then an empty lot. 1993 use: Rooming House (Hudson House). 1993 condition: Retained original form without significant alteration. Location among newer buildings left the Hall looking somewhat run down.